← And I Quote… . Brunch (for our foreign readers, “brunch” is a combination of breakfast and lunch, generally taken around eleven o’clock in the morning) or luncheon. Or drinks and snacks in the garden. Sunday’s late morning or early afternoon nosh can be a simple or as complex as you have time to prepare. Our hosts treated us to a feast of artichoke, egg, pepper, onion casserole and hash browned potatoes that rivaled anything I’ve had in a restaurant. Bloodies (Zing-Zang mix provided the base for us to work up into our preferred versions) and Mimosa’s before made the day take on that more leisurely tone. The 70ºF and sunny weather just added to the feeling of torpor that began to steal over the group. Thankfully, our little crowd had in common a love of laughter and that alone kept us from drifting off to lotus land. Two weeks from now our garden gate will be open to our friends who are taking the air with a leisurely Easter Promenade, as our once lively parade has become. We won’t be serving a full meal, but we will have nuts, a cheese board, perhaps some ham biscuits and something sweet arranged on a white table cloth covered card table placed in the shade of the backyard. A beverage tub will be indispensable for keeping a half case of pop (Champagne), beer, ice tea and bottled water chilled at any one time. The cooler of ice will be hidden under the card table along with reinforcements. I’ll use cloth napkins, of course, and my appetizer plates to hold any foods that may be a bit messy. Sterling salad forks will be shoved into a juice glass for ready access. A vase of flowers will seem redundant, but carry the garden onto the table. While we’ll use real glass flutes and glasses for the adults, I’ll have plastic stadium cups on hand for the kids (and for adult “go-cups”). Hats, naturally, will be de rigeur. What are your key ingredients for a successful garden party or brunch? This entry was posted in Entertaining and tagged appetizer plates, Beverage Tub, Brunch, Easter Sunday, Woodrow Wilson House, Zing-Zang Bloody Mary Mix. Bookmark the permalink. I’ve never had one, but this is beyond inspiring. Beautiful. Key ingredients? Loved ones. Champagne. Eggs Benedict. Champagne. Pastries. String quartet. Champagne. The sound of the ocean. Oh and musn’t forget, more champagne. sounds lovely — I am inspired! A large sliced ham with everything for yummy custom sandwiches is a good, casual sunday “lunch” (lat lunch/ early dinner, to get kids to bed on time). I also love doing a platter around a large bowl of aioli (called a petite or grande aioli in the south of france). Steak, fish, crudite, anything that is good topped with aioli (and what isn’t?). LOT’S of champagne and rose wine! Although lacking severely in the food and drink department, I was inspired by this and spent the greater part of this afternoon on the campus lawn playing croquet with some friends. Less popular than the ubiquitous frisbee, but a bit more elegant I think. Next time some iced tea or sparkling cider with nibbles might be necessary. Too bad the school frowns upon open bottles of champagne on campus. LBT, your’s is the winning recipe. Spendidmarket, as we say: “if it’s swine, it’s fine.” And can you go wrong with aioli? Simply Refined, You are setting the groundwork. My favourite birthday party was given by Mrs. E. just after we’d met. 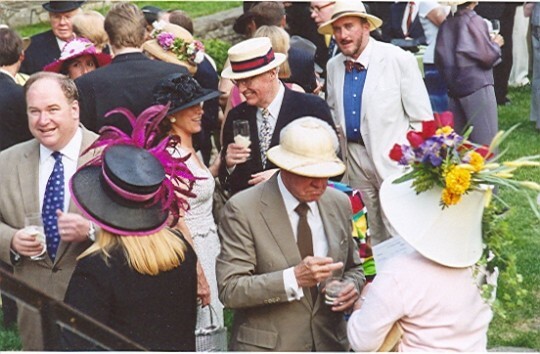 Croquet, a jazz ensemble, and cocktails in Middlebury, VA. Thus begins the stuff of (personal) legend. DC, ain’t it the truth. And it wasn’t that long ago. Effort pays off. A garden party will be well received. Mrs. B.! Of all people? You and the Mr. would revel in the afternoon’s festivities. A few quail from the day’s hunt…. Nice weather certainly helps. However, even when that happens to be the case, I must say that trampling on a damp, mushy lawn does not do it for me. The thought of getting my esteemed John Lobbs pasted with soil or possibly the occasional pet´s discharge would certainly be most distracting. I believe that a good idea is to have the lawn area around the card table covered with rugs or a hard wood surface. I am all with Alessandro! Spread those old and worn Persian rugs out there on the gravel? Wonderful! Gravel is much easier than lawn! You have inspired me!! I will have a Spring luncheon! I have just the spot! Alessandro and Ms. Bianchi, we live in the city and our yard is small, has a concrete walk and a gravel seating area … just the thing. I’m all for taking out the orientals though! For me,brunch must include plenty of cold champagne,sun and trusted friends recounting the previous night’s adventures. If I’m hosting,lunch itself must be both filling and easily served. Quiche Lorraine and fruit to eat, perhaps. More important, guests must know to leave by three in the afternoon; or find a comfotable spot for napping.I find drinking during the day brings on a serious case of laziness cured only by sleep itself.